Ella came to the Medina Raptor Center in November 2007 after being hit by a car in Lakewood, OH and was sitting on half-eaten prey and was very thin. She was rehabilitated and released in March 2008 before being returned a month later with a broken wing after she hit a wire at the Lorain County fairgrounds in Wellington, OH. The injury to wing was severe that she would not be able to sustain any long flight and became an educational ambassador to her species. 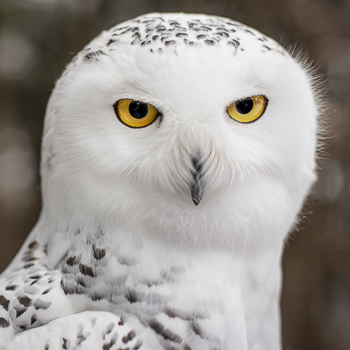 At the extreme northern margins of the arctic tundra lives the Snowy Owl, the northernmost, heaviest, and most distinctively marked owl of North America. Largely diurnal, it spends much of its time perched still and silent on prominent lookouts, waiting to make forays for prey. Variable amounts of dark brown barring on head, wings, back, breast, and tail. Feet white and completely feathered. Bill black and mostly covered by feathers. Female slightly larger and more heavily barred. Male may be entirely white. Immature like adult female. Male gets whiter as it ages. Lemmings, when available. Also rabbits, rodents, waterfowl, other birds, and fish. Breeds in high Arctic from coastal Alaska across Canada to Labrador. Also in northern Greenland, Scandinavia, and Russia. Breeds on open tundra. Winters in fields and on beaches. Waits on a perch until it locates prey, then pursues and seizes prey in its talons. Can also locate prey visually or by sound, even in dense grass or under thick layers of snow. A scrape in the ground, formed into a rounded depression by the female. Population sizes difficult to estimate because of size and remoteness of habitat. No information on long-term population changes, except an apparent decline in northern Europe. Generally silent in winter. Call a deep, powerful hoot. Also a series of harsh clicking.